First Bahrain, a Kuwaiti real estate company, announced today the achievement of full occupancy at its flagship project, the Majaal warehousing development. 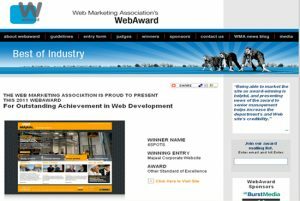 The Web Marketing Association (WMA) announced today that they have selected Majaal.com for a “Standard of Excellence” 2011 WebAward. This recognition from a global organization is reflective of the world-class nature of the brand and the website developed by 4SPOTS, a leading interactive agency headquartered in the Kingdom of Bahrain. 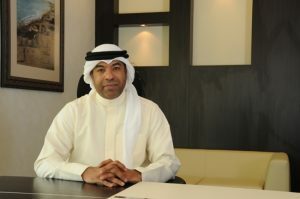 Amin Al Arrayed, General Manager of First Bahrain and Managing Director of Majaal Warehouse Co. was interviewed for a soon to be published Bahrain Country Report prepared by MarcoPolis, a press and communication agency headquartered in Paris, specializing in the production of economic and upscale tourism country reports. 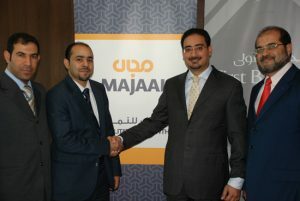 First Bahrain, an innovative real estate developer, announced the signing of a new tenancy agreement for its flagship project, Majaal. A leading marketing and advertising agency, R Media Co., has chosen the Majaal warehousing and logistics complex to house both its main office headquarters as well as its primary printing production center. First Bahrain, an innovative real estate developer, announced today that it has signed a new tenancy agreement for its flagship project Majaal Warehouse Company. Elie & Jean Hair Products Accessories Co., the marketing arm of Elie & Jean International Hairdressing, a renowned five-star Ladies and Gents hairdressing company in Bahrain, has chosen the Majaal warehousing and logistics complex as its primary regional storage and distribution center. 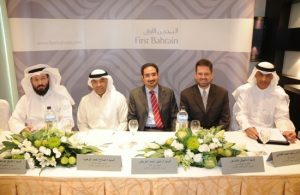 First Bahrain, an innovative Kuwaiti real estate company, held its annual general meeting (AGM) at its headquarters in Al Khaleej Tower in Kuwait to discuss the company’s achievements and the 2010 financial report. Despite the challenging environment, the company reported a net gain for the year, overcoming losses posted in 2009. The company began generating operating revenue from its delivered projects in 2010 and continued to reap valuable benefit from its consistent and conservative approach to the management of resources. First Bahrain, an innovative regional real estate developer, today received key faculty members of Bahrain Polytechnic (BP) at First Bahrain’s flagship project Majaal, an SME-focused warehousing facility. The BP faculty were welcomed by Amin Al Arrayed, General Manager of First Bahrain and Managing Director of Majaal. 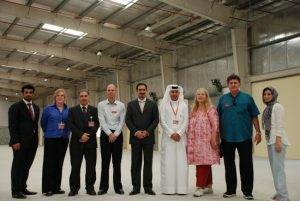 The visitors were given an extensive tour of the facility by First Bahrain team members, to get more insight into the development and trends in the logistics industry. 31 December 2010 is scheduled for 22 May 2011. The meeting will be held at 11:00 at its offices which are located on the 15th floor of the Al Khaleej Tower on Abu Baker Al Sadeeq Street in Al Qibla, just north of the Sheraton Hotel. First Bahrain, an innovative regional real estate developer, announced today it has repaid in full a US $ 1.5 million loan to Kuwait Finance House (KFH). Maintaining its solid liquidity, the company repaid on the maturity date the three year term loan issued by KFH in 2008 to provide the initial funding for First Bahrain’s flagship project Majaal, an SME-focused warehousing facility. First Bahrain, an innovative real estate developer, announced today that it is still attracting overseas companies to set up business in Bahrain and has just signed a new tenancy agreement for its Majaal Warehousing Company. 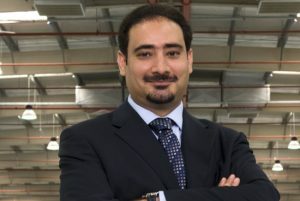 Switz Group, one of the Middle East’s largest manufacturers and distributors of bakery products, has chosen Majaal warehousing and logistics complex as an ideal location to serve the expansion of their subsidiary brand, to be known as Bahrain Masterbaker WLL.